A sea of red sand lies along the Atlantic coastline, comprising the oldest desert on the planet: The Namib, after which Namibia is named. Namibia is renowned for its massive, abundant space boasting a large variety of wildlife in a kaleidoscope of diverse environments, in which to inhale deeply and bask in an infinite supply of blue skies, sun-drenched weather, and tranquil starry nights. A land of infinite contrasts to savor, enjoy and photograph. Botswana offers one of Africa's most exhilarating wilderness experiences, offering a great diversity of landscape and a variety of wildlife and birds. Linyanti, Jao and Mombo combine together to offer a rich wildlife experience featuring Big Cats, Hyena, Wild Dog, Rhino, Elephant, Buffalo, Giraffe and Antelope amongst many other species. 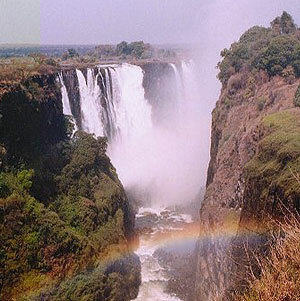 One of the seven natural wonders of the world; the 1708-meter wide Victoria Falls is the largest curtain of water in the world, dropping more than a hundred meters down to the Zambezi. Livingtone town, located just ten kilometers away from the fall offers an exciting range of activities, including guided excursions to the Falls, elephant back safaris and romantic boat trips on the Zambezi at sunset.
" Apart from the beauty of the varied landscapes on this safari, game viewing is excellent and safari camp accommodation is exquisite. " 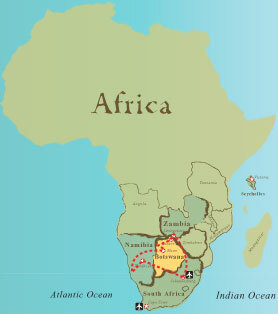 Top: Elephant back safari in Zambia; Top Left: Hot Air Ballooning in Namibia. 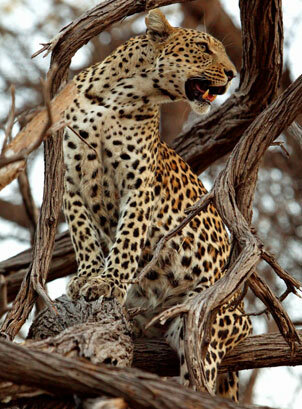 Above: Leopard at Mombo; Inset: Victoria Falls. Bottom: Nambian desert, culture and wildlife. Photos by Wilderness Safaris and Micheal Poliza. The best game viewing occurs within these dry winter months in Botswana. Great time for photography and viewing the dunes. August can be very windy. September is the very best time to go if your plans fall during this month.